With the help of the big-name Italian brand, Loiza Lamers and Ben Melzer hope to bring visibility and equality to the fashion industry. Despite efforts by many individuals and companies within the fashion industry to become more diverse and inclusive, there is still a lot of work that needs to be done in order for transgender models to have the mainstream visibility that so many of their cisgdnder counterparts are usually (and automatically) afforded. 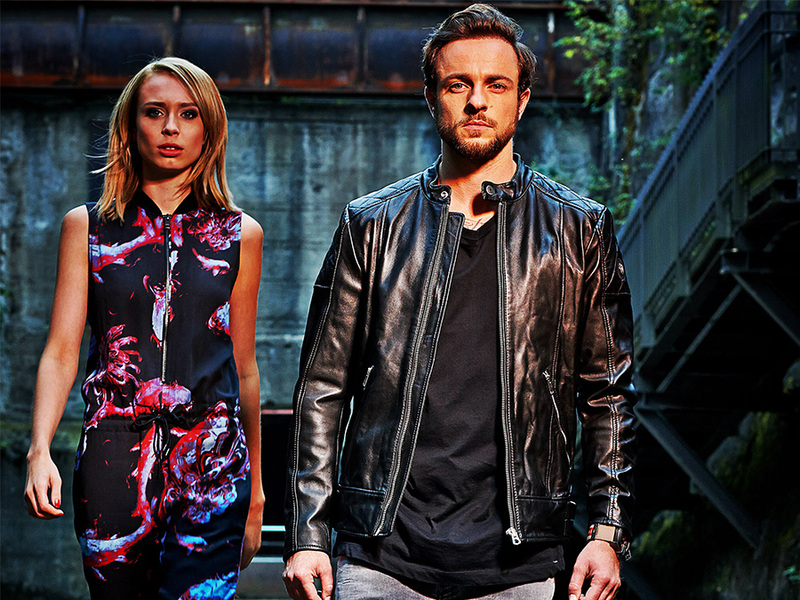 And trans visibility is what popular Italian retailer Diesel is hoping to achieve with their latest collaboration,"About You," starring trans models Loiza Lamers and Benjamin "Ben" Melzer. Loiza, who was the first trans winner of Holland's Next Top Model, and Ben, who was the first European trans man to be featured on the cover of Men's Health magazine, have run into some difficulties before breaking out into the modeling world, but they're not going to let that stop them from realizing their potential and reaching for their dreams (which, for the both of them, include a Calvin Klein underwear campaign). PRIDE got the chance to chat with Loiza and Ben just ahead of the launch of "About You," and we learned more about their aspirations, what it was like being the face of a worldwide brand, and that behind every pretty face is a story. PRIDE: Tell us a little about your background. Where are you from and what got you into modeling? Loiza: I’m from Holland. I grew up as a transgender child, so I was a boy, and I transitioned into a girl. I was really young, I was 7 years old when I started my transition. Starting hormones and everything on my 16th birthday, and after that, like two or three years after, I was like 'Okay, I want to do something else.' I was a hairdresser, and I was like no, there is more. I started modeling. I always wanted to do that, but I never had the courage and the support to do it for myself. I joined Holland’s Next Top Model, and I won. I was the first transgender model ever to win the Holland’s Next Top Model franchise, so that was big news. I worked on my own, and I started working with Benjamin, and that’s where we are right now. PRIDE (to Loiza): How did your life change after winning Holland’s Next Top Model? Loiza: It changed everything. I was a known person, from just a girl living in a village. I was a known person, and I was worldwide news. Even Perez Hilton wrote about me, so it was bananas. It was crazy. It changed a lot, in a good way. PRIDE (to Ben): How did your life change after being featured in Men’s Health? Ben: I didn't expect what happened after that. It went viral. Like, everybody around the world contacted me for interviews and wanted to do something with me, and even Ashton Kutcher sent me a congratulations on Facebook. I thought it was a fake, but it wasn't. It was real. That was absolutely amazing. I'm working very hard on where I want to be. I really want to do big campaigns. I want to be the first trans man to do a Calvin Klein underwear campaign. That's my life goal! That's what I'm working for. And I'll get there. I'll get there. PRIDE: What is it like working with each other? Loiza: Working with Ben is amazing. He's an amazing guy. He's so sweet and he's so polite, and I love to work with him. We feel each other. We have the same story, we have the same feeling. It's amazing to work with him. Even our personalities really mesh with each other. The fact that we're both transgender really makes it happen and that's the magic between us. I've never worked with another transgender model. Ben is the first transgender model I've ever worked with, and his personality makes it great. Ben: We're friends today. I love her! She's like my little sister. She's very professional. We always make fun of us on set. There was a construction worker at the Diesel set. She wore blue jeans, and the construction worker in the back, he had the same jeans on, and they looked very similar. Like, 'Hey, is that the guy you're doing the shoot with?' and stuff like that. It was very funny. We're always making fun of each other, which is very cool. It feels like I've known her for years. We met this year at fashion week in Berlin. PRIDE: How did you get involved in Diesel’s new collaboration? Loiza: For Ben and me, we started working together, and we knew each other, and it was like we need to do something for the equality of transgender models. Every big brand in the world wants to work with transgender models because of the hype, and we we’re not just the hype. We’re real models, we’re working for our bodies, we’re working for our walks, and we’re posing and everything. We’re just as equal as any other model, only we have a background story. For us and our management, it was really important to carry that out to the world, so we wanted a big fashion brand who wants to work with us, and let us do this for equality of models, and make it easier for other transgender models to come into this business. Diesel was really willing to work with us, and that’s how we got involved with Diesel in doing this collaboration. Ben: They contacted me. They sent me a mail, asking me to do something with them, and I was like 'Oh my god, okay!' I want to do things that I really feel comfortable with, and Diesel is a brand that I really like, and of course it's a major brand. My management, they wrapped it up, they talked to them, and they built a concept. It was epic. It was never done before because I did it with Loiza, and it's two transgender individuals doing a major collaboration. This is amazing, but it wasn't about us being transgender. It was just about us, the models, and we have a story. It's not the first thing they focused on. They just really liked us and our style. PRIDE: What’s the best part about being included in their new collaboration? And what does it say about Diesel's brand that they are doing this? Loiza: I want to be a big model. I want to be known everywhere. I’m working on that, so this is the first step for us. Let’s carry it out to the world and let people see us. Let’s tell them our story. You know what I said, to be the pioneer of transgender models and for the equality. So for us, Diesel was a big collaboration, it was like this is our start. We’re gonna get so much fired up with this collaboration, and this is just one of many. The first of many. Ben: I think the industry is changing, and this is a step. Diesel is very brave, doing that, and I think it's great for other transgender individuals, especially in this industry. Me and Loiza are trying to open doors for others, so what's hard for us right now, what we really have to fight for, should be easier in the future for others. PRIDE: What is your favorite part about being a model? What is your least favorite part? Loiza: My favorite part about being a model is the traveling. Working with different people, and getting to know other people and countries. It so variated, so different. Everything is different, so for me, that’s the most beautiful thing. I don’t think there is something I like the least. I love this job, I am willing to work for it. Ben: I love to be on set and getting dressed and have all the people around me taking care of me. That's amazing. Like, you're in the middle of the room and everybody's taking care of you. It's all about you! That's a very good feeling. It's super cool. (My least favorite part) is that it's always so short-timed. People telling you that you have a shoot within the next days, and you don't know what day, and then they tell you one day before, in the evening. I don't like that, because I'm German and I am always on time and I need to plan everything. That's very hard for me, but it's okay. I'll get used to it. PRIDE: What are some of the challenges associated with being a trans person in the modeling industry? Loiza: Of course I was discriminated in the past, but in the modeling industry…people see us as hype. When Caitlyn Jenner came out, every transgender model was hyped up, but I'm not just hype. Ben and I are just models, willing to work, willing to do everything it takes to get as big as, like, Kendall Jenner or whoever. That's our goal. I'm not only transgender. I am a model. Ben: Before I had a management, I wrote a lot of letters to agencies asking them to take me as a model into their portfolio, and they all told me 'No, you're not tall enough.' I guess the industry is changing. Look at Ashley Graham. She's the plus-size model, and she looks amazing. I'd love to work with her. She's amazing. Also, Cara Delevingne. She's not very tall. So it's not about height, I guess. It's about story, and it's about the character behind this pretty face. That's not all. I'm not just a pretty face. I have something to say. I'm a human. That's the problems I had to face when it all started. It was very hard, but giving up is not an opportunity for me. Every time someone told me 'you can't,' it gave me a little push and I try to teach to them that I can. And I think one day, they'll all regret their decisions and will knock at my door. That's what I'm saying to myself, and that keeps me going. My fans, they also send me a lot of messages, and that also gives me strength. PRIDE: Did you have any trans role models when you were coming up? Loiza: Not really in the modeling industry. When I was beginning, there wasn't that much publicity for transgender models, so I hope I can be the role model for upcoming trans models. Ben: I had nobody. That's why I decided to do it, publish my story. There was nobody who could have answered my questions, and everything. I had to go through it alone, which was very hard. I had a lot of role models, like Michael Jackson, Justin Timberlake, and just normal guys, but no transgender role models. There was no one. I had no clue that I was a trans guy until I turned 18. That was the moment I realized, because I saw something on TV, 'Hey, you're trans. You're not alone. You're not just different, you're a trans guy.' It has a name to it. Finally! PRIDE: What’s it like knowing that you can be a role model to trans youth? Loiza: I would love to be that person. It's so great. When I was a known person, when I got the messages in from all the people in the world, like 'Oh my god, you're so amazing! You're so strong! Can you help me?' and 'Your story, it opened doors for me!' It's amazing that you can inspire other people by just being yourself. I love it, and I've just begun speaking for the LGBT community here in Holland, so I do like seminars speaking about different things, and it's so amazing to get all of that positive energy from them. Ben: To me, it's unreal, because those kids sending message like 'Hey, I want to be like you!' I just see myself as a normal guy, so I don't see myself as a role model. It's cool if I can help people when I'm doing what I'm doing, but I don't see myself like this. I always tell everybody, when you look in the mirror, the hero is standing right in front of you. You have to go through all of that. It's cool that I can help you with answering questions, but at the end of the day, you have to go through this, so look in the mirror and you see your hero. PRIDE (to Loiza): Do you feel like there is a lot of pressure placed on you, being a trans woman in the modeling and fashion industries? Loiza: I feel pressure, of course. It's hard to get in, to do your work, and to get on the same level as Doutzen, as Kendall, as Gigi. It's hard. But for me, since I'm transgender, it's even harder. It's like the same pressure that every other model faces. It's hard to get in this industry, but I'm good with myself, I'm good as a person, and I feel great. This is what I want. Nobody can hold me down, so I'm gonna do this. That's the only pressure I'm allowed to feel. To work, to get where I want, and to reach the finish. PRIDE: If you could give the fashion industry one message, what would it be? Loiza: Equality. Equality for models. It's so important to get equality. And I'm a normal person! I'm trans, of course, and that's my back story. But I'm a model. I'm a woman. I work for my things. And that's why I want to have equality. Ben: See the person behind the face. Don't judge a book by its cover. PRIDE: What advice would you give to any young trans person who wants to break into the fashion/modeling industry? Loiza: Being trans and being a model, you have to work on your sizes, you have to do what every other model needs to do, so for me, it's like, even if people are denying you for being a trans model, there are more opportunities and there are more ways to get there. Stay positive, do your thing, live your dream, and everything will be fine. Ben: Be patient. There will be a lot of people telling you 'you can't.' If you really fight for your dreams, you can.You just have to be very, very patient, and don't give up. Check out the behind-the-scenes video of Loiza and Ben on the set of Diesel's "About You" collaboration below, and for information, visit the official website here.